Throughout history, people have migrated within their country and across borders for many reasons: from education and employment to reuniting with family and improving living conditions. In a country like Bangladesh, which largely depends on agriculture for not only its economy but also for feeding its large population, environmental stressors such as floods and drought can be devastating. These stressors can often lead to crop failures and can be a key reason for why households make the arduous decision to migrate from rural areas to urban centres in search of a more stable income, as well as food and other resources. Despite government efforts to diversify and support livelihoods in rural areas, rates of internal migration to urban centres throughout the country continue to rise. A new study, which originated from a field visit to Gibika project site Bhola Slum as part of the UNU-EHS Resilience Academy in Bangladesh in 2013, shows that internal migrants leave rural areas in search of security and are driven by the hope for new opportunities. Instead, they often find themselves faced with new challenges and risks when they reach their destination (usually urban centres). 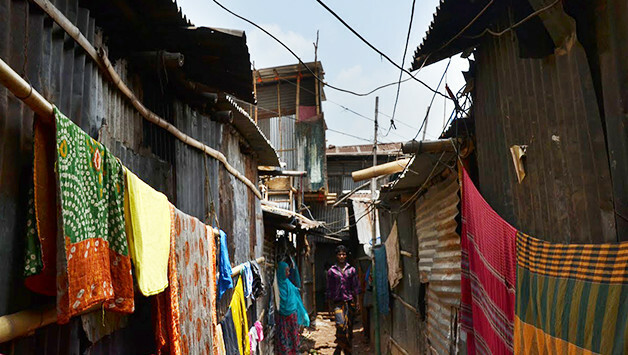 The findings are based on a case study of Bhola Slum – an urban slum in Dhaka – and draws on interviews and focus group discussions with locals living in the slum. The majority of Bhola Slum’s residents can be traced back to Bhola Island, located 300 km south of Dhaka. On 12th December 1970, the catastrophic East Pakistan Cyclone hit Bhola Island and ravaged the surrounding Ganges Delta. As many as 200,000 residents (or one-fifth of the population) from Bhola Island died, thousands were made homeless, countless livestock perished, crops were destroyed and epidemics of typhoid and cholera ravaged the population. In the decades since the cyclone, more residents from Bhola Island have moved to Bhola Slum due to lost land mass from sea level rise, flooding and erosion. Urban slums have begun to swell beyond capacity, particularly in Dhaka, Bangladesh’s capital. Bhola Slum is one of the most densely populated areas of Dhaka with approximately 4,500 adults and numerous children living on a mere 1.65 acres. Residents unanimously agreed that their biggest concern has been the constant fear of eviction as they have no property or land rights. As explained by one resident, “We are trying to collect and save some money but we don’t have the ability to buy this land as it is huge and expensive, we live hand to mouth and so we don’t have that much money to buy this land”. Environmental hazards are also a major concern for residents. Fire has caused devastation in the slum in the past, but flooding appears to have caused the most distress for residents. Past floods have reached over two metres in height and have destroyed housing and possessions as well as caused damage to key infrastructure. In Bhola Slum, basic life-supporting resources and infrastructure such as freshwater, sanitation and healthcare all fall short of basic human needs. For example, while there are water pipes in the slum, they are not sufficient in number and at times the drinking water mixes with the sewer water. Open sewer channels also traverse homes in the slum, resulting in break outs of diarrhoea and typhoid. Residents of Bhola Slum have employed a number of strategies to reduce these risks and concerns. Some strategies have included taking out large loans for the male head of household to work overseas, having women work long hours outside the home (usually in the garment industry), raising houses above ground level, and creating social capital through initiatives such as a women’s co-operative. However, these strategies often expose people to future risks. For instance, borrowing large sums of money to send the male head of household overseas can lead to stress from being separated, the pressure to pay off crippling debts, the risk of indentured servitude and exploitation, and increase the overall vulnerability of the household by leaving a lone female as head of household. Risks associated with the increasing number of women taking up jobs in the formal economy sector, such as the garment industry, include no minimum wage regulations, long hours and poor remuneration as well as the lack of worker’s rights or protections. To minimise flood risk, households have been elevating their houses above ground level. This adaptation may only be effective in the short-term as the slum is located on a floodplain. The floodplain was once a swampland that has since been filled in, which makes it the lowest point in the area and therefore always at risk of flooding. As a final strategy, a women’s co-operative was established to foster the strong social capital that existed in the slum amongst neighbours, friends and family groups. The role of the women’s co-operative was to provide a source of security and unity for women through the provision of micro-finance loans to members. However, in less than two years of its creation the co-operative has dissolved due to power struggles and infighting about the mission and activities of the group, resulting in a loss – instead of a gain – in social capital (including qualities such as trust, reciprocity and cooperation) for these members. Migration is a difficult decision, but is seen by migrants as a risk reduction strategy. However, the results of migration do not always lead to the desired end. As this study has shown, migrants often move into urban slums and are faced with overcrowding, eviction threats, environmental hazards, infrastructure deficits, resource strains, and limited or no basic services such as safe drinking water, sanitation and waste disposal facilities. Consequently, rural-to-urban migration can result in different or greater risk exposure which increases people’s vulnerability rather than reducing it. It is crucial that policy-makers and the non-government sector working in this area consider these risks when implementing policies and development work. Programs and activities that alleviate these new risk scenarios facing migrants in urban slums need to be prioritized. These programs could include designing smaller urban centres with adequate infrastructure to incentivise migrants to relocate away from Dhaka, creating opportunities for migrants to move away from a low-paying labour economy to more knowledge-based livelihoods, offering vocational training programmes and educational facilities, and improving urban infrastructure. This blog post is based on the journal article “Insecure hope: The challenges faced by urban slum dwellers in Bhola Slum, Bangladesh”, which was published in “Migration and Development” in 2015.